(This is a part of my "Explained" series of posts. To view my "Time Travel Explained" post, click here, to view my "Heartless, Nobodies, Unversed, and Dream Eaters Explained" post, click here, to view my "The Realm of Sleep Explained" post, click here, and to view my "The Braig/Xigbar Situation Explained" post, click here.) To start this off, I will first have to explain the differences between all of the "χ" titles of Kingdom Hearts games: Kingdom Hearts χ[chi] was a Japanese-only browser game that is now discontinued. So, in order to experience this title, you can watch all of the story-related cutscenes translated to English in the YouTube playlist here. You can also watch a full English translated playthrough in the YouTube playlist here. Kingdom Hearts Unchained χ was the name of an iOS and Android smartphone game before it got rebranded to "Kingdom Hearts Union χ[Cross]." Kingdom Hearts Union χ[Cross] is essentially a rebranding of Kingdom Hearts Unchained χ. You don't have to get Kingdom Hearts Unchained χ, because by getting Kingdom Hearts Union χ[Cross], you are getting Kingdom Hearts Unchained χ, since it's a part of the title. They renamed the app to "Kingdom Hearts Union χ[Cross]" to help promote the "season two" of the game, which is titled "Kingdom Hearts Union χ[Cross]." Kingdom Hearts χ Back Cover is a movie included in the Kingdom Hearts HD II.8 Final Chapter Prologue HD collection for the PlayStation 4. Yes, Kingdom Hearts χ[chi], Kingdom Hearts Unchained χ, Kingdom Hearts χ Back Cover, and Kingdom Hearts Union χ[Cross] are all different titles. They are not remakes or remasters of each other. Kingdom Hearts Unchained χ is a sequel to Kingdom Hearts χ[chi]. Kingdom Hearts Union χ[Cross] is a rebranding of Kingdom Hearts Unchained χ, as well as the name of the "season two" of the game. Kingdom Hearts χ Back Cover is a movie that tells some of the story of Kingdom Hearts χ[chi], but through the perspective of different characters. These things makes all of these separate Kingdom Hearts titles. It's sort of difficult to explain how Kingdom Hearts Unchained χ is a sequel to the original Kingdom Hearts χ[chi]without spoiling things, so here's an explanation that's light on spoilers and one that's heavy on spoilers: Spoiler-light explanation: Kingdom Hearts Unchained χ is a sequel to the original Kingdom Hearts χ[chi], because at the end of the original Kingdom Hearts χ[chi], something happened to the characters which causes them to go through their entire journey again, except without the finale (the Keyblade War). Kingdom Hearts Unchained χ is you playing as the character from the original Kingdom Hearts χ[chi] going through their entire journey again, except without the finale. So, as you can see, Kingdom Hearts Unchained χ sort of acts as a mobile port of the original Kingdom Hearts χ[chi], as well as a sequel to it. The "season two" of Kingdom Hearts Unchained χ, called "Kingdom Hearts Union χ[Cross]" continues the game from after the characters have completed going through their entire journey a second time. Spoiler-heavy explanation: A part of Ava's role given to her by The Master of Masters is to divide the Dandelions into five different Unions with their own Union leaders, just like how the Foretellers were the Union leaders of five different Unions. The five Dandelion Union Leaders are Ephemer, Skuld, Ventus, Brain, and Strelitzia. Marluxia's original self, Lauriam, has killed Strelitzia, took her copy of the Dandelion Union Leader rule book, and then took her spot among the Dandelion Union Leaders. They are to go into the Unchained realm (the realm of sleep) in order to prepare for the world after and to forget their moments of tragedy (their memories of the Keyblade War). To make this happen, the Chirithys owned by the Dandelions will bring their owners into the Unchained realm (they're Dream Eaters, so they can do this) and they have to lie to the Dandelions and say that the Keyblade War was just a dream and they can't tell them they're in the Unchained realm. This is all to make them forget their moments of tragedy because those memories won't be needed in the world after, according to The Master of Masters. The only people who know about these lies that they have to tell the Dandelions are the Dandelion Union Leaders, Ava, The Master of Masters, and the Chirithys. Kingdom Hearts Unchained χ is a sequel to the original Kingdom Hearts χ[chi] that takes place in the Unchained realm. During the original Kingdom Hearts χ[chi], the Dandelions (as well as the soon to be Dandelion Union Leaders) went into the Unchained realm. The Dandelion Union Leaders then left the Unchained realm and came back to the real world after the Keyblade War ended, while the rest of the Dandelions stayed in the Unchained realm. The Player survived the Keyblade War, and Ephemer and Skuld decided to make the Player a late Dandelion. The Player's Chirithy took the Player to the Unchained realm and had them forget what happened. Now, this is when Kingdom Hearts Unchained χ begins. There, in the Unchained realm, the Player and all the Dandelions are repeating their entire journey from the original Kingdom Hearts χ[chi] over again in order to have them forget the Keyblade War and make it seem like it was just a dream. They're within their own dreams, just like how Sora was within his own dreams near the end of Kingdom Hearts 3D: Dream Drop Distance. Now, in the "season two" of Kingdom Hearts Unchained χ, called "Kingdom Hearts Union χ[Cross]," the Player and the Dandelions have finally caught up with and gone through their entire journey from the original Kingdom Hearts χ[chi] over again (except without the Keyblade War). The Player has begun getting flashbacks from the Keyblade War. They think it's just from a dream though. The group of Dandelion Union Leaders go from the Keyblade Graveyard back to Daybreak Town and decide to celebrate by providing new Spirits for the Dandelions. Ephemer goes with Skuld and Ventus to collect the necessary ingredients, while Brain and Lauriam stay behind in order to prepare. Soon after, a Chirithy approaches the Player and, using some of Player's Chirithy's fur, creates a "pet" Spirit for them. In the original Kingdom Hearts χ[chi], the Foretellers used the Book of Prophecies to conjure up illusions/projections of worlds of the future. These are the Disney worlds in the game. In these projected worlds, the Keyblade wielders are to destroy Heartless (which are also conjured up projections from the future) in order to gather Lux (light) from the future. In the original Kingdom Hearts χ[chi], all of the Disney worlds that the characters go to, all of the Disney characters that the characters meet, and all of the Heartless (except for Darklings) are just illusions/projections conjured up by the Book of Prophecies. Since The Master of Masters and Luxu both disappeared and the Foretellers (presumably) died in the Keyblade War, there is no one to conjure up the illusory worlds of the future any more. So, The Master of Masters created data versions of the worlds in advance. The worlds that the Dandelions are going to in the Unchained realm are these data worlds. Maleficent was stabbed by the Keyblade of Heart by Riku in the first Kingdom Hearts. This gave her the ability to time travel. So, she time traveled to the past in order to try and rewrite history and make it so she wasn't defeated. She time traveled to after the Keyblade War and ended up in the data version of Enchanted Dominion. A data version of herself exists there, so she was able to time travel there. She was unaware that it was a data world until a shadowy figure calling himself "Darkness" pointed it out to her. He explained that The Master of Masters knew she was going to do this, and prepared the data version of Enchanted Dominion to trap her in in advance, so that she would not be in the real world. He does not want her in the real world since she possesses memories and knowledge of the future. "Darkness" then explains to her that she needs to return to her own time. If you would like to know how time travel works and how Maleficent was able to time travel since she was stabbed by a Keyblade, you can check out my "Time Travel Explained" post here. And if you would like to know more about the Unchained realm (the realm of sleep), you can check out my "The Realm of Sleep Explained" post here. Here's a simple step-by-step of what you should do to experience the entire "χ" story: 1.) Watch the story-related cutscenes for Kingdom Hearts χ[chi] translated to English. You can watch them in the YouTube playlist here. You can also watch a full English translated playthrough in the YouTube playlist here. 2.) Watch the Kingdom Hearts χ Back Cover movie that's included in Kingdom Hearts HD 2.8 Final Chapter Prologue. If you've already seen it, then watch it again since it will now make a lot more sense after watching the story-related cutscenes for Kingdom Hearts χ[chi]. 3.) Watch the first cutscene in Kingdom Hearts 0.2 Birth by Sleep -A fragmentary passage- Kingdom Hearts HD 2.8 Final Chapter Prologue. This cutscene with Luxu takes place after Kingdom Hearts χ Back Cover. If you've already seen it, then take a look at it again since it will make a lot more sense now. 4.) Download Kingdom Hearts Union χ[Cross] for iOS or Android. 5.) Play Kingdom Hearts Union χ[Cross] for iOS or Android. If you don't want to play it, then you can just watch the cutscenes. It's very repetitive and long, so I understand if you don't want to play it, but I recommend giving it a shot. If you don't like it and decide to just watch the story-related cutscenes, then you can watch them in the YouTube playlist here. The game is still ongoing, so I will update that playlist whenever new story-related cutscenes come out. And that's it! A continuation of the last theme I made for Xehanort but with additional parts (to represent multiple boss forms) and touched up sounds to make it sound over all better and more realistic. The Second segment was inspired by "Darkness of the Unknown". Hope you all enjoy. I will explain time travel in Kingdom Hearts and how it works for those of you who don't quite understand it, or don't understand it at all. I hope this helps anyone who was confused with how it was explained in Kingdom Hearts 3D: Dream Drop Distance. (This is a part of my "Explained" series of posts. To view my "Heartless, Nobodies, Unversed, and Dream Eaters Explained" post, click here, to view my "The Braig/Xigbar Situation Explained" post, click here, and to view my "The Realm of Sleep Explained" post, click here.) What is time travel in the Kingdom Hearts universe? Well, it's like time travel from any other game, movie, or show. It's where you leave your present time and move either backwards or forwards to a different time. How does somebody time travel in the Kingdom Hearts universe? First, you must abandon your body and become just a heart. One way to become just a heart is to extract your heart with a Keyblade. Another method would be to become a Heartless, since Heartless are technically just corrupted hearts. Once you become just a heart, then you have the ability to move through time. Becoming just a heart also gives all versions of yourself from across time the ability to time travel. But, they're not actually able to do so without assistance from someone who actually has a time travel power. Just because you have the ability to travel through time, doesn't mean you're actually able to do so. You can only time travel if you are just a heart, or if you have the time travel ability plus assistance. I will elaborate what I mean by "assistance" later in this post. What are the laws of time travel in the Kingdom Hearts universe? You are only able to travel through time if there is a version of yourself present at the time you want to travel to. Also, you cannot change what is destined to happen. All that really means though is that you cannot change the future, because everything is already set in stone. Once you return back to your respective time, you will forget everything that has happened during your experience time traveling. However, these memories and experiences will be etched into your heart and could influence your decisions and the paths you take. Since you lose your memories after you get back to your respective time, there would be no point in traveling to the future to try and find out what happens. That is what we know so far about time travel in the Kingdom Hearts universe. Now, I will explain various characters' involvements with time travel. Terra-Xehanort Terra-Xehanort is Terra's body taken over by Master Xehanort. 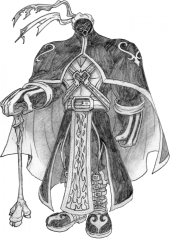 He apprentices under Ansem the Wise so he can further study the darkness and get access to things that could potentially help him further gain powers of the darkness. He steals Ansem's name and identity, then splits himself into a Heartless and a Nobody. His Heartless is known as the Robed Figure, and his Nobody is known as Xemnas. 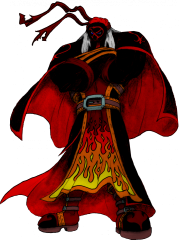 Robed Figure/Ansem, Seeker of Darkness The Robed Figure is Xehanort's Heartless, as stated above. Since he is technically just a heart since he is a Heartless, he is able to travel through time. He goes back in time to Destiny Islands, where he meets a young version of himself. Now that Xehanort is just a heart, all versions of Xehanort throughout time have the ability to move through time. Not without assistance though of course. The Robed Figure gives/shares his time travel powers that he has from being just a heart to this Young Xehanort. Now, this Young Xehanort is able to time travel without becoming just a heart and without assistance. The Robed Figure then goes back to his own time (during the first Kingdom Hearts) and places himself on Destiny Islands. He marks the time traveling Sora with the Recusant's Sigil. The Robed Figure later possesses Riku and sort of molds/forms Riku's body into a body that's more to his likeness. Bodies are just as malleable as hearts. This amalgamate is known as Ansem, Seeker of Darkness. Young Xehanort As explained above, Young Xehanort, and all other versions of Xehanort, now have the ability to move through time. And Young Xehanort is able to do this without assistance as if he was just a heart, because the Robed Figure shared/gave him some of his powers. He then goes through time and brings with him various versions of himself and some followers/vessels who have been loyal to him before. 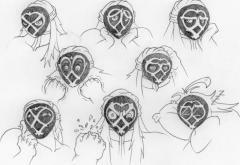 He gathers 10 versions of himself and brings them to the present day. Out of those people, the current known ones are Xemnas and Ansem, Seeker of Darkness, Xigbar, and Saïx. These are all people who are deceased in the present time. The individuals that Young Xehanort brought through time have the ability to move through time, because Xehanort became just a heart somewhere along his timeline (when he became a Heartless/the Robed Figure). They aren't actually able to do so though without assistance from someone who actually has a time travel power. 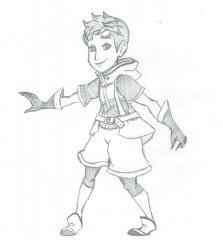 Young Xehanort is their assistance, since he has an actual time travel power that he got from the Robed Figure. If someone has never became just a heart somewhere along their timeline, then they can't move through time even with assistance. Young Xehanort time travels to Destiny Islands during the first Kingdom Hearts. He is able to do this because the Robed Figure placed himself there. He follows Sora and Riku into the realm of sleep. Now that Sora is marked with the Recusant's Sigil and now that Young Xehanort is in the same time period as Sora, Young Xehanort is able to teleport to wherever Sora is and keep tabs on him. Master Xehanort Master Xehanort is the one who took over Terra's body, as explained above. He has returned to the present day because Xemnas and Ansem, Seeker of Darkness have been destroyed, which are his Nobody and Heartless. Once someone's Nobody and Heartless are destroyed, the original person is revived. It is currently unknown why Master Xehanort's old man self was recompleted instead of Terra-Xehanort. Master Xehanort gathers with Young Xehanort and the 10 people that Young Xehanort had gathered. Xemnas Xemnas is the Nobody of Terra-Xehanort. He was destroyed by Sora. He has now been brought back to the present day by Young Xehanort. Ansem, Seeker of Darkness (pt.II) Sora has destroyed him. Young Xehanort brings him back to the present day. Xigbar Xigbar is the Nobody of Braig. Xigbar has been destroyed by Sora, and has revived as Braig, but he has also been brought back to the present day by Young Xehanort. It's also possible though that he wasn't brought back from the past, and the recompleted Braig was just turned back into a Nobody in order to be a more suitable vessel. Either of those two situations are possible. Saïx Saïx is the Nobody of Isa. Saïx has been destroyed by Sora, and has revived as Isa, but he has also been brought back to the present day by Young Xehanort. It's also possible though that he wasn't brought back from the past, and the recompleted Isa was just turned back into a Nobody in order to be a more suitable vessel. Either of those two situations are possible. Extra Info Xehanort's plan has been to gather 13 vessels that all would bear a piece of his heart inside of them. This was Xemnas' plan with Organization XIII, but a few of the members he had gathered were inadequate. This is what lead to the various new people that Young Xehanort had been gathering. He gathered 10 people and along with himself and Master Xehanort, that makes 12 people. Their original planned 13th member was Riku, but he became immune to the darkness, so he was of no use to them, then they chose Roxas, but he became too aware of himself and returned to Sora. Xion was also a possible candidate, but she returned to Sora as well. Now, they moved down the list to Sora. They were able to capture him, but he had been saved. They are currently missing a 13th member for their new Organization XIII and will soon find a replacement. Sora and Riku In the beginning of Kingdom Hearts 3D: Dream Drop Distance, Sora and Riku traveled back in time to the day Destiny Islands fell to darkness. They had the ability to move through time because both of them have become just hearts at one point in the first Kingdom Hearts. Sora became just a heart/a Heartless when he stabbed himself with the Keyblade of Heart, and Riku became just a heart when his heart was sort of kicked out of his body into the Realm of Darkness when he was possessed by Ansem, Seeker of Darkness. This caused all versions of Sora and Riku from throughout time to gain the ability to time travel. But, they weren't able to do so without assistance, so Yen Sid assisted them. Yen Sid used magic to send them back in time, which is a different method of time travel than Xehanort's method. Instead of becoming just a heart and going back in time to give a version of themself the time travel power in order to assist other versions of themself through time, Yen Sid just assisted them by using time travel magic to send them back in time. Characters like Yen Sid and Merlin have time magic. But, Yen Sid's time travel magic still follows the rules of time travel that this post has been explaining. He could only send Sora and Riku back in time to a point in time where versions of them existed/were present. Sora and Riku are younger in Kingdom Hearts 3D: Dream Drop Distance simply because of Yen Sid's magic as well. He used his magic to make them younger again in order to sort of help with the whole starting over from scratch for the Mark of Mastery exam thing. They didn't inhabit their younger bodies contrary to popular belief. They didn't need to become just hearts in order to time travel, because they had the time travel ability plus assistance. Them becoming just hearts would've been a big mess as well. They would've turned into Heartless/Nobodies. Timeless River In case anybody was wondering, no, Timeless River has nothing to do with any of this. Timeless River is a completely separate time anomaly that brings you to the world of Disney Castle before Disney Castle has been built. Now that I explained various characters' involvements, I'll list some currently unanswered questions concerning time travel in the Kingdom Hearts universe. Hopefully these get answered and cleared up in the future. Unanswered Questions Why did the time traveling members of the Thirteen Seekers of Darkness go back to their own time? And how are they going to come back? In the Kingdom Hearts Re:coded secret ending, we see the Organization XIII members who were residents of Radiant Garden lying on the floor after being recompleted as people again. We also see Braig, who is not lying on the floor like the rest of them. He presumably woke up before them. (We know this Kingdom Hearts Re:coded secret ending takes place after Kingdom Hearts Re:coded and before Kingdom Hearts Dream Drop Distance because Ienzo is an adult in this cutscene. There is a cutscene in the beginning of Kingdom Hearts Dream Drop Distance that shows Even and Ienzo on the floor turning into Heartless/Nobodies and Ienzo is a little kid in that cutscene, so we know the Kingdom Hearts Re:coded secret ending takes place after Kingdom Hearts Re:coded because we know Ienzo grew up as an adult while he was a Nobody.) In Kingdom Hearts Dream Drop Distance, we see Xigbar. It is thought that this is actually Braig, not Xigbar and he's just going by the name Xigbar for some reason (most likely because of the Recusant's Sigil in that name). If this is the same recompleted Braig that we saw in the Kingdom Hearts Re:coded secret ending, then how come he has long hair again and how come he has gray in his hair again? It would not make sense for him to just all of a sudden change appearance and grow hair that quickly. Is this actually Xigbar and not Braig, and they were just implying that it was Braig just to trick us? If it's Xigbar, then that can either mean that he was brought to the present day from time travel, or that can mean that Young Xehanort turned the recompleted Braig back into a Nobody for some reason (maybe he's stronger as a Nobody?). Also, do people keep their appearances that they had as Nobodies when they turn back into people, or are they reverted to how they looked before they were turned into Nobodies? This is very unclear. It seems that some parts of them did keep their appearance and some parts of them didn't for some reason. Ienzo, Lea, and Isa aged as Nobodies and kept their ages when they turned back into people. Lea lost the markings under his eyes when he became a person again though for some reason. From what we know, this is how it is: You are reverted back to how you looked before you became a Nobody, but you keep your age. For example, Lea was reverted to how he looked before he became a Nobody which is why he lost the markings under his eyes, but he still looks older because he kept his age. What was the Riku that Riku saw in Monstro in Kingdom Hearts Dream Drop Distance? Was it the dream world projecting an image of Riku from the first Kingdom Hearts? Putting Riku "back in his place," like it did to Jiminy in Sora's side of Prankster's Paradise? If so, then why is he wearing a black coat? Riku wasn't wearing a black coat in the first Kingdom Hearts, and the worlds only dream about their pasts, so this wouldn't make sense. Is it a Seeker of Darkness? If that Riku is a Seeker of Darkness, is it Riku Replica? If it's Riku Replica, then why did Riku say "That was my... my dark side. I gave into the darkness once, and ever since, it's chased be around in one form or another. The seeker of darkness who stole my body, a puppet replica of the shadows in my heart, and now, I'm facing me."? He lists the versions of his darkness that have chased him around in one form or another. He lists Ansem, Seeker of Darkness and Riku Replica and then says that now, he's facing himself. 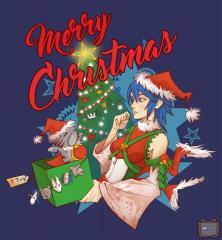 So, it's not Riku Replica, right? Unless Riku's just assuming it's not Riku Replica. If it's just himself (Riku) that he was facing, then was it when he was a villain in the first Kingdom Hearts that's time traveled to present-day to be a Seeker of Darkness? If it's Riku Replica or himself from the first game time traveled to present-day to be a Seeker of Darkness, then how come Young Xehanort isn't there with him? Like stated above, Tetsuya Nomura stated that Young Xehanort functioned as a "portal" that summoned the Xemnas and Ansem, Seeker of Darkness. Wouldn't it be the same for Riku Replica/Riku from the first game and any other time traveling Seekers of Darkness? If not, then why? You can check out my post that lists every single currently unanswered question in Kingdom Hearts here. I hope this helped anybody and I hope it cleared up confusion that any of you had. This was a type of character I wanted to see in Kingdom Hearts AND Fullmetal Alchemist. His strength and alchemy seem to be his greatest weapon, but his greatest is actually his own mind. If anyone likes Lex Luthor, Magneto, and Batman, hopefully, they'll love Crimson. HUGE SPECULATION, Will, Why And How will the Master Keeper play a role in KH3? So the other day i was thinking about KH3 and i had glanced over at the reveal trailer from last year. But for some reason i started to think deep into the reason of why sora, was on destiny islands AND encountering the Mater Keeper. As we know the master keeper is only supposed to be wielded by KEYBLADE MASTERS. So why is Sora being presented with it? My first thought was that its a trailer, they probably wanted to throw a cool keyblade in there to make it better, but i discounted that immediately. There has to be a legit reason why the Master Keeper is here WITH SORA. Could it be his connection to Ventus, and Ventus's connection to aqua through the wayfinder that brings Sora to the Master Keeper? Is the Master Keeper now essential? Does it have more power then we know? Did it seek Sora intentionally? In DDD they spoke of (A power or ability but) something that could bring those that have fallen back (Aqua,terra,ven,roxas,ect). Is the Master Keeper the "Real Deal" That it will not only restore those that have lost but also be what is needed to defeat Master Xehanort? And why is it on Destiny Islands? (It may be the connection i spoke of before). I'm interested in everyone else's thoughts. Please add anything you'd like to the discussion, As well as speculate and brainstorm!